If you are assessing a new withdrawal or proposing to register a new withdrawal for the first time, choose "New Withdrawal" below. 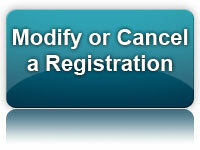 If you are modifying an existing registration you have made through the water withdrawal assessment tool, choose "Modify Existing Registration" below. Note: Modifying an existing registration is required when the actual withdrawal construction deviates from what was proposed during the initial registration. This includes modifications such as: changing your location, well casing depth, capacity, etc. Will this registration replace a previous withdrawal? 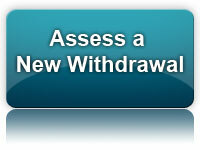 Change characteristics of a previously registered withdrawal. 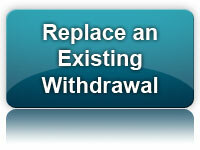 Cancel a recently registered withdrawal.